Ok so newby here didn't quite understand how this worked. I thought the time frames were Edwardian then Victorian. Therefore, when someone said to me that looks like something from the Victorian Era I would visualize a timeline showing one after the other. On the contrary they overlap. Therefore, for obvious reason many of the styles would be the same. However, the English influence (ie Queen Victoria) in jewelry design does differ in some ways. Moreover, the Victorian era was broken up into three periods. The Romantic Period which spanned 1837-1860. The Grand Period spanning from 1861-1885, and finally the Late Period from 1885-1901. Young Queen Victoria took the British realm by storm. She was greatly loved by her countryman. Therefore, the Romantic Period is named in honor of her marriage to Prince Albert. The mood of the country at this time was love knots, hearts, hands, eyes,crosses and clovers. Ah, young love. However, during this love for queen and country a lot was going on around the world. Gold is discovered in California in 1848 and the excavation of sights in Egypt and Greece add to the jewelers creative designs. Even though the influx of gold from California have an impact the main customers for jewelry remain the elite. As for the designs, many of the pieces of this era would have clusters of seed pearls or turquoise. One really neat design is acrostic jewelry. The designer would place the stones in a specific order spelling out meaningful words. For example, a ring with a 2 rubies, an emerald garnet, amethyst and diamond. Don't worry I'm not expecting you to figure it out the word is REGARD. Personally I think that is rather creative. The metals preferred to jewelers was 18-22 karat gold keeping the costs still higher in the beginning. The ring below has many of the attributes of the Romantic Period. The European cut diamond inset into the oblong piece of onyx and claw or colette settings is very indicative of this time. The Grand Period is next. This mid Victorian Era begins with war lending to the proliferation of mourning jewelry. It became very important to have something to remember one by. As in the picture below hair might be woven and placed as a keepsake in the pendant and then a painting depicting who's hair it it. It this particular case it is 3 children (shown by the 3 urns). This turns out to be a great transitional period. Silver is discovered in Nevada, a diamond mine in South Africa and the invention of the light bulb in New Jersey. This period is now more affordable for the masses. The industrial revolution and creation of machinery enables a jeweler to make several of one design. Hand fabrication remains only an elite option. With this however, the bulky large jewelry is no longer the fashion. We are now looking for lighter pieces. The gypsy look is very big at this time. embedding the stones in pave settings using silver with gem stones or low Karat gold (9, 12, or 15). The rose cut and european cut diamonds are still fashionable. A rose cut diamond will have a round shape, with a domed top and flat bottom. 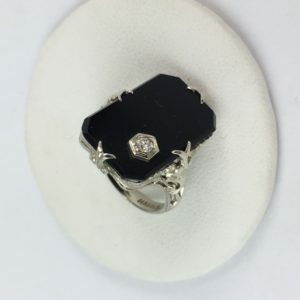 A European cut or old mine cut will have more facets and closely resembles the round brilliant of today (the diamond inset in the onyx in the ring above is an example of this). Finally the last period during the Victorian Era was the Late Period. This was truly an extension of the previous two eras. Love is still in the air with the interlocking heart motif, stars and wishbones, knots and bows. Stick pins and choker necklaces were very big during this time as well. The piece above is a great example of this era. 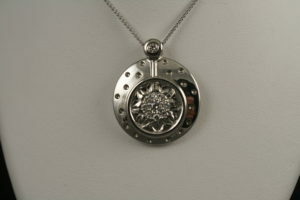 It is a custom piece we did, but it shows the starburst center that was very common along with inset diamonds. Lighter more practical pieces continue to be the rave. Gold, platinum and silver also seem to be the metals of choice. Still another intro to this period is Tiffany's solitaire diamond engagement ring, which is still commonly seen today. Aquamarine, opals moonstones and the use of black glass are commonly found as well. So, now are you an expert? I sure know I am not. I want to thank the American Gem Society for much of the information I was able to gather. I would also like to say read, read and read some more. Estate jewelry is a vast industry. 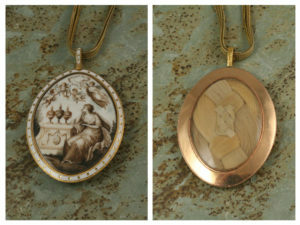 As with the pendant above, it is "like" that time period but made within the last few years. Don't be hoodwinked into thinking you are buying a rare item created in that time period. I would be remiss to not say paper trails help immensely. But even without that, appraisers can be very helpful to you. I always say, when in doubt ask. I would also be remiss to say, if you like the look it shouldn't matter when but how well the piece is made. Enjoy!!!! !